Dr. Chungwon Choue, president of the Korean Fair Play Committee, poses with the prizewinners of the 1st Korean Fair Play Award in a ceremony at the Olympic Parkel in Seoul, Korea, on Nov. 21, 2007. The Korean Fair Play Committee, headed by WTF President Chungwon Choue, organizes the award ceremony annually starting this year. The Korean Fair Play Committee (KFPC) held its first Korean Fair Play Award ceremony in Seoul, Korea on Nov. 21, 2007. The awarding ceremony took place at the Olympic Parktel in Seoul, drawing hundreds of sports figures. In the men's individual division, Song Jin-woo, a pitcher of the Hanwha Eagles professional baseball club, earned the honors as the winner of the 2007 Korean Fair Play Award. The honors in the women's individual category went to Chun Joo-weon, a guard of the Shinhan Bank Sbirds women's basketball team. The Korean national men's and women's basketball teams shared the 2007 Korean Fair Play Award in the team division, while Kim Kun-tae, referee manager of the Korean Volleyball Federation and a FIVB referee, won the honors in the special prize division. A seven-member KFPC Screening Committee selected the 2007 Korean Fair Play prizewinners after strict selection sessions, mainly based on the applicants' outstanding examples of fair play attitude and good sportsmanship in sports. The committee's conviction is to regard fairness as more important than winning at all costs. As part of its efforts to promote the spirit of fair play and sportsmanship in the Korean sports community, the KFPC, which was inaugurated in 2006, presents Korean Fair Play awards annually starting in 2007. Chungwon Choue, president of the World Taekwondo Federation, was nominated as the first president of the KFPC in its inaugural General Assembly in Seoul on Sept. 26, 2006. The KFPC plans to recommend the prizewinners as the Korean candidates for the World Fair Play Prizes for the year 2007, which is organized by the International Fair Play Committee. "We will present the Korean Fair Play Awards every year, thus helping bring about a brighter society by spreading our fair play campaign in a more organized and systematic way to all sectors of Korean life," KFPC President Choue said during the awarding ceremony. The KFPC serves as the Korean national body of the IFPC, whose headquarters are located in Paris, France. The IFPC presents World Fair Play awards annually in three categories - act of fair play, sports career, and promotion of fair play – to famous and less-known athletes, coaches, teams, and organizations all over the world. Iranian Hadi Saei Bonehkohal, the gold medalist in the taekwondo competition at the 2004 Athens Olympic Games, was voted by the IFPC as the World Fair Player of the Year 2005 for his humanitarian efforts. Juan Antonio Samaranch, former president of the IOC, and Jacques Rogge, president of the IOC, serve as honorary presidents of the IFPC which strives for the worldwide defense and promotion of fair play with national and international organizations working for sport and education, high-level athletes, children, adolescents, and those in charge of training them – coaches and trainers. The KFPC awarding ceremony followed the 3rd Korean Olympic Academy Congress at the same venue, in which KFPC President Chungwon Choue delivered a keynote speech on "The Spirit of Fair Play and Movement" for a Better Society before about 250 participants. The congress was jointly organized by the KFPC, GCS International and the Korean Olympic Academy to mark the 19th anniversary of the 1988 Seoul Olympic Games. GCS International, a U.N.-recognized nongovernmental organization with a special consultative status with the Economic and Social Council, was set up in 1979 to promote the three spirits of goodwill, cooperation and service. GCS International, which is headed by WTF President Chungwon Choue, has since 1986 held an international peace conference in cooperation with Kyung Hee University and the International Association of University Presidents. The KFPC announced its final list of 45 officials at the awarding ceremony. 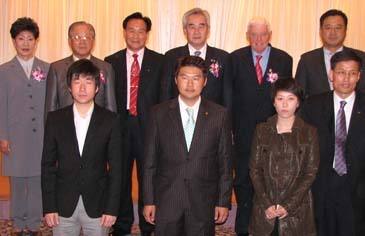 Among the KFPC officials are Kim Jung-kil, president of the Korean Olympic Committee, and Park Seh-jik, former president of the Organizing Committee for the 1988 Seoul Olympic Games, both of them serve as honorary presidents of the KFPC.